This website is intended for wholesale and institutional clients only. Neither the company nor this website offers investment advice, either general or specific. No reliance should be placed on, nor action taken in relation to any information or data contained herein. By continuing to view this website you are agreeing that you will take no investment-related action, and that no liability shall rest with AAS Economics, in relation to this website. Here you will find access to economic research that is at once unique and challenging. Through our redefinition of money supply – informed by readings in classical economics – and our advanced quantitative modelling we are able to produce iconoclastic forecasts at the macroeconomic, microeconomic and asset allocation levels in multiple countries across numerous asset classes. As you will see from the profiles of our Team members, our skillset is broad and deep, ranging from academia to government to financial market advisory to hedge fund management and beyond. Our clients see us ﻿as providing a radical counterpoint to traditional forms of economic and market analysis. We apply consistent themes, based on core principles, to economies and markets even where these economies and markets appear to differ markedly, either geographically or temporally. A brief overview of our methodology can be found here in a convenient Q&A format. The AAS Economics approach to economic and asset market analysis is simple yet effective. It is our view – and our observation over many decades – that what we know as the business cycle is predictable. Once the cycle is predicted then the performance of asset classes and individual assets can be better forecast. The cycle is primarily caused by monetary phenomena. 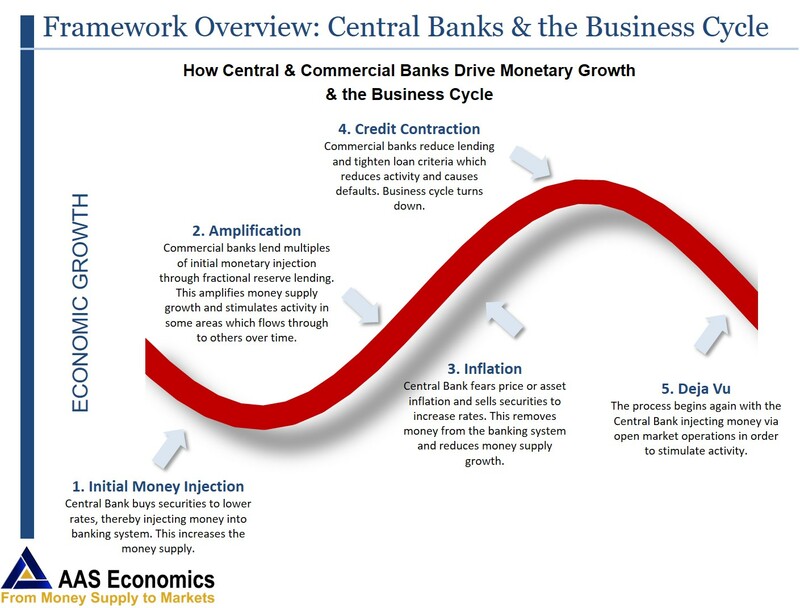 In particular, inflation and contraction of the money supply (including through interest rate policy) initiated by the central banks and amplified through credit creation by the commercial banks, lead to various outcomes. Firstly, the actions of the central banks affect the signals received by economic agents in their day-to-day activities. This may manifest in changes in expectations, changes in their time preferences, or other factors. Secondly, money created by the central banks (for example via open market operations) is picked up by the fractional reserve banking system. The banks, being able to lend multiples of the funds that they have on deposit and in "reserves", begin to create credit – essentially out of thin air – which ripples out into the economy in ways and at speeds that would not have occurred prior to the central banks' activity. This newly created money finds its way unevenly through the economy as some businesses and sectors receive it earlier than others and expand their activity. These early leaders can drag other sectors with them but can also create cost pressures for those sectors not enjoying the largesse, as those other sectors are forced to compete for resources while not seeing a proportionate increase in demand. This process then results in re-allocated resources throughout the economy while at the same time giving the appearance of generalised economic growth, as more money is deposited with banks who further amplify the cycle through additional fractional reserve lending. The newly created money finds its way not only into product markets but also into asset markets, leading to increases in asset prices - both sectorally and more generally. However, as the contradictions created by this monetary expansion become manifest – for example via prices rising first in some areas and then spreading more widely – the central banks decide that enough is enough and the brakes are applied. Those who have been late to the monetary party feel the damage first, as the growth forecasts that formed the basis of their borrowings fail to materialise, their profits decline or turn to losses and their bankers get cold feet. Now the process goes into reverse. The banks first begin to restrict lending (or demand repayment or increased collateral) in the sectors highly populated by latecomers and then, when other related sectors begin to decline, this credit contraction becomes widespread. The mistakes of misallocated capital return to haunt lenders and borrowers alike, with both economic activity and asset prices declining. Sadly, the state may step in to aggravate the process through bailouts of industries "too big to fail". And all the while different sectors and different assets are responding in different ways to these changes in monetary conditions driven by central and commercial banks. 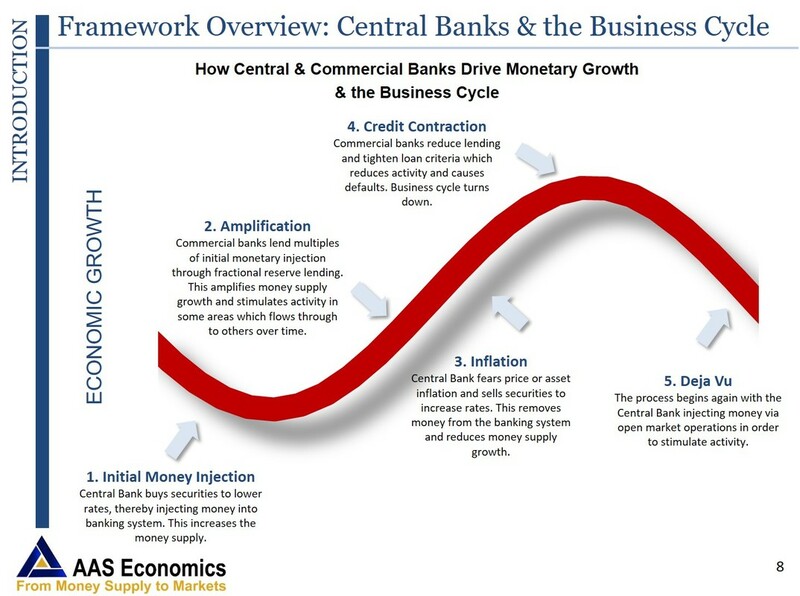 Eventually, of course, the wheel turns again and the central banks decide that monetary stimulus is required (and often the state more broadly intervenes along similar lines using fiscal and bailout policies). The entire cyclical process, along with its inevitable misallocations of resources, is then re-commenced. Our approach to analysing these leading trends in money and credit creation lends itself both to quantitative modelling and to historical testing. Our first step in modelling each economy and market is the calculation of our key monetary aggregate, which we call Adjusted Money Supply or AMS. AMS is a redefinition of money supply using principles derived from Austrian economics. We then place changes in this variable at the heart of our 300-equation econometric model and use this model to forecast major economic variables and changes in asset prices. Employment, industrial production, real GDP, bond yields, commodity prices, exchange rates and inflation are among the economic variables which we are able to forecast using these techniques (see our Research page). Given the leads that changes in AMS provide when predicting the business cycle, it is also possible to forecast the health of various specific sectors of the economy as the cycle moves through its various stages. Thus it is possible to use our AMS-driven approach to predict which business sectors are likely to flourish, and which to decline, as the cycle unfolds. For investors this gives valuable, forward-looking sector insights which can assist in stock selection and asset allocation. Further, it is possible to derive overall asset allocations across multiple classes such as equities, bonds and commodities. All of these are discussed further in our Research area. Please don't hesitate to contact us to discuss our work in greater detail. We made some very big calls in 2018. See how we went. 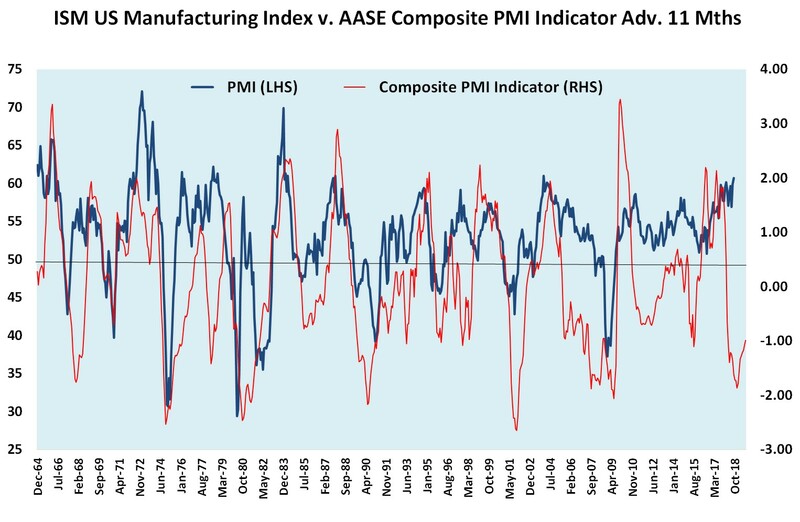 Our PMI forecasting model for the US is telling a sobering story. The picture for the Eurozone is similar, as is China's, Australia's and the UK's. 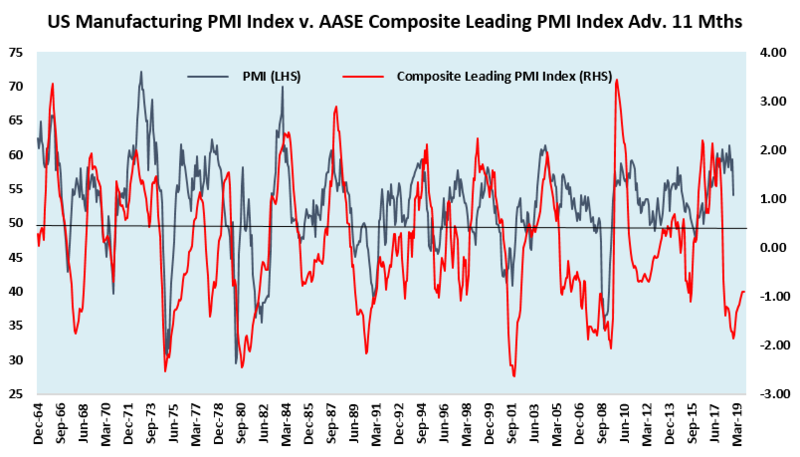 To see these other charts and learn more about our Composite Leading PMI Index series please contact us. See what we said back in March about the prognosis for the Eurozone economy. See how our unique approach to business cycle forecasting adds alpha. We model the likely impact.